This recipe is inspired by the region of Lombardia in Italy. Pierce potatoes in several places with sharp knife. Bake 45 min. to 1 hour or until tender. Transfer to wire rack; let stand 15 to 20 min. or until cool enough to handle. Cut potatoes lengthwise in half. Scoop out centres into medium bowl; discard skins. Mash potatoes until smooth; spread into thin layer on lightly floured surface. Add egg yolk; mix well. Add flour, 1/2 cup at a time, kneading after each addition until blended. (Dough will be slightly sticky.) Divide into 4 pieces; cover. Let stand 10 min. Roll each portion into 3/4-inch-thick rope on lightly floured surface; cut crosswise into 1/2-inch-thick pieces. Dip fork into flour; lightly press tines of fork over each piece to make ridges. Cook pasta sauce in large skillet on medium-low heat 5 min. or until heated through, stirring occasionally. Meanwhile, cook gnocchi, in batches, in boiling water in large saucepan 2 to 3 min. or until gnocchi float to top. Use slotted spoon to transfer gnocchi to pasta sauce in skillet. 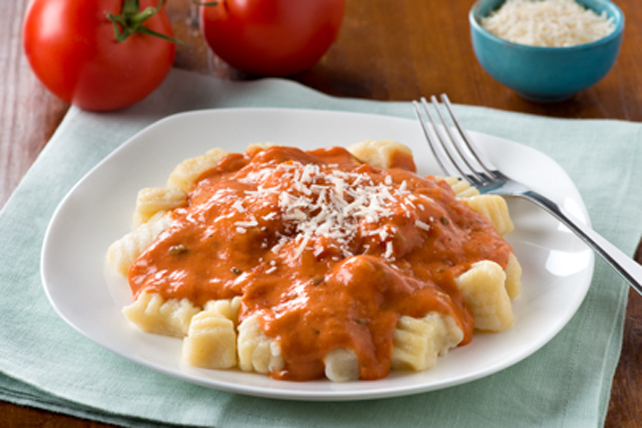 If sauce is too thick, stir in enough of the gnocchi cooking water until sauce is of desired consistency. Sprinkle with cheese. Garnish with 2 Tbsp. chopped fresh chives before serving.